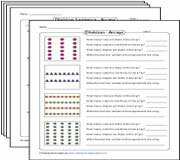 Embedded in this unit of division worksheets are varied strategies for third-grade kids to learn the basics of division with a range of hands-on tasks, such as cut-and-paste sharing activity, drawing objects for equal sharing, division by grouping objects, dividing by distributing objects in rows and columns of the array model, number line, bar model and area model. Spin a story around the illustrations to introduce the concept of division. 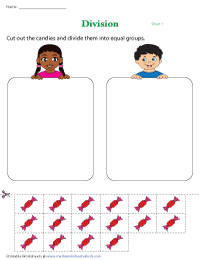 Snip the pictures, divide them into two equal parts and glue them in the columns and learn division by equal sharing in the process. 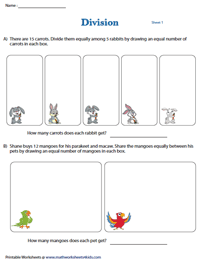 Blend fun and learning with this alternative exercise for grade 3 kids. Read the scenario carefully, share the objects evenly, draw the correct number of specified objects in each group to complete the worksheets. Pictorial models to divide numbers is an interesting strategy and most helpful in solving word problems. Represent the division equation as a rectangular bar and divide the bar into equal parts to find the quotient. 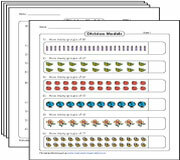 Familiarize kids with the grouping strategy of division using this set of worksheets. Group objects, answer questions based on the model, complete the division statements, figure out left overs and much more. 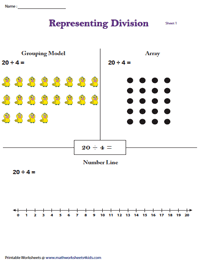 Work out the quotient by observing arrays of objects distributed across rows and columns, answer questions, decipher arrays to write a division sentence, solve word problems and draw arrays to bolster division skills. 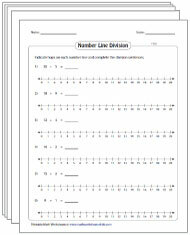 Interpret the division sentences on the number lines by drawing hops, read the number line and write the division equation, MCQs and many such activities, help develop division skills with ease. 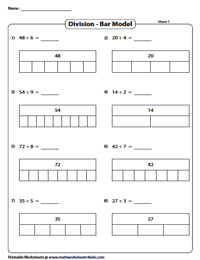 Recapitulate three division methods with this interesting 3-in-1 activity worksheet. Solve for the quotient by representing each division equation as a grouping model, an array model and on a number line. Visually represent the division equation as a rectangle. 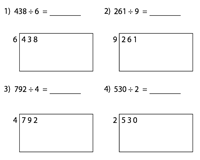 Write the multiple of the divisor and subtract from the dividend. Repeat the process until you get a 0. 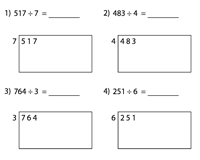 Direct students of grade 4 to solve the division equation using the area or box method by repeatedly subtracting the multiples until they can't be subtracted anymore and add up the partial quotients and find the remainder.